Take a moment to examine how you feel about the space or place you are in. Site programming recognizes there are opportunities to improve the user’s surroundings. From the scale of a classroom to an open plaza, the opportunity for a variety of activity is designed by extensive program research. Site programming may include the results of a site analysis, climatic statistics, geographic information, transportation egress and access, user analysis, feasibility studies, budgeting estimates, timelines, history, demographics, logistics, etc. It investigates and organizes in easy-to-understand visualizations the physical, social, financial and heritage criteria of what improvements can be made and for whom. It studies populations of users and their spatial and socio-cultural needs. The program establishes threads of continuity from the past use of the site, to the present to a proposal for the future. The set of ideas involves the who, what, when, why and where. In answering these questions and proposing and testing strategies with stakeholders, the program document serves as an instrument of communication between the designers and the users. Understanding the conditions and needs that initiate site programming is one of the most important steps. Question the performance of the space or place. Is it safe? Is it comfortable? Is it quiet? Is it beautiful? What is missing? Why don’t people like coming here? What is unattractive to this place? Why do you like or dislike the space? Finding the right questions to ask is an important starting point. With basic observational skills, site programming then asks, “What is not working here?” Make a list of questions that you will ask when you look to improve a space. Once you understand that a place or space could be improved, it is important to consider for whom will it be improved. Identifying who currently uses (or doesn’t use) the space will direct the design. People of various ages, occupations, cultures and with different hobbies, interests, personalities and backgrounds will use the same space differently. The exploration of possible mixes and simultaneous consequences of different populations is important to research and understand. Begin to understand the possible users of the space by charting the ages of participants. What conclusions can you draw from your observations? Do you find any patterns or correlations between the age groups and activities within the space? How would the improvement of the space allow a wider variety of users to enjoy it? Identify a list of possible users. When activating new programs, it is important to think about the hours of the day. Early morning is for people who get up before dawn. Certain times are busy with people going to work. Others are for people with small children taking fresh air or looking for places to play. The noon lunch hour collects people in public spaces. Dinner time and evening offers other opportunities for people to walk through, be in, move, around, into and out of space. Not only within a day, but also the change of seasons should be studied as well. People use public and private spaces in unique ways when it is hot, cold, rainy, or snowy. Time is a major driver of design. Make a chart of possible activities in the space or place based on the time of day, night, and seasons. To activate a space means to combine your previous observations of users and programs within the space and draw some connections between people and activities. What does it take to create a space that allows for those connections to form? What activities would connect and enhance the surrounding neighborhoods? Make a list of possible activities and the age groups that could partake in them. With your conclusions from your previous analysis on users and programs, imagine future activities and how the space or place can be reshaped. Make a diagram of your ideas and activities. Patterns are the direct bridge to conceptualizing life into existing spaces. Look at current uses and imagine new patterns to inform overall space concepts. What will people do here? What are the destinations they will seek? What paths will they walk or bike? Where will they sit? Will they eat here? Will there be music? Is there room for sports? Is art exhibited? Is art made? After mapping and diagramming a thorough site analysis, overlay future activities and share with diverse audiences for feedback. Be sure to identify points as destinations, paths to connect, and activities in fields of areas. After mapping and diagramming a thorough site analysis, overlay future activities and share with a diverse audience of users for feedback. When presenting, draw connections between current uses and new uses that will form patterns to inform overall space concepts. Site programming is so important because design integrates a space into the daily routines of the people who uses it. Be sure to identify points as destinations to stop by, paths to connect through, and activities in areas of the new space. 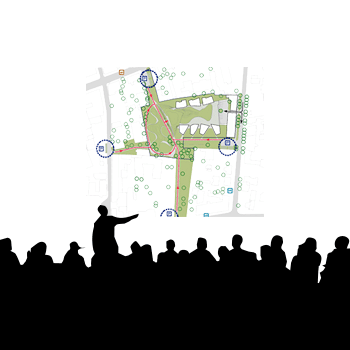 Locating the site and understanding a site initiates the creation of a concept for space be it a public space, workspace, park, or public playground. The driving activities and users then inform the placement of activities and destinations of the actual space. Revisiting the questions of who, what, when, and where locate activities in plan and section. Select a site. Create a concept. Design possibilities! Draw and model in plan and section and elevation. Now that you have developed design ideas, it is time to share them! Getting feedback from clients, and users, individuals and groups, is a critical step in the design process. Surrounding yourself with creative people raises the innovation of a project. It also creates connections between future ideas and the present. People can begin to imagine what a new design might look like, the excitement and attraction it might develop, and the fun and enjoyment it might encourage. Building identity through public programming is an age old practice. Present, in person, your design. Take a note-taker who can copy comments. Post your ideas in a neighborhood store window and set up a box for comments. Make an online survey with before and after pictures and have individuals rate their preference. Once you have a site and the programming of activities and users is complete, it is important to prepare the path forward. What will the ideas cost to build? What time will it take to realize them? Who will participate and contribute? What environmental issues need addressing? What will officially start the process to achieve the ideas? What money, materials, and permits will be necessary. Create a timeline to actualize a program. Often all of the charts including research, public input, conceptual iterations, revisions, and preparation of the proposal or phasing of the proposal overlap with each other. Make a timeline of the key phases of the project that include meetings, research, concept development, design iterations, testing and evaluation, initiation, construction, and occupancy. Site programming looks for opportunities to improve a space or place. Site programming uses a combination of public input, research, iterative design, and other preparations to reach the end result. Site programming doesn’t really affect or change a person’s daily routine. Site programming can bring diverse populations togethers in new ways.